Child support is calculated in one of two ways, either for sole physical custody, or shared physical custody. This Part 1 of 2 will explore the Sole Physical Custody calculation. (Remember, “Sole” physical custody means that one parent has custody more than 65% of the time. “Shared” means that both parents have at least 35% custody of the children). Let’s start by looking at the Sole Physical Custody Worksheet (Worksheet “A”). Part A – Caption. This is the heading of the child support case. It gives identifying information to the Court including case number, parties (parents) names and addresses. Part B – Children. List the names and birth dates for the minor children (under 18) of the parties (where both parties are the Mother/Father). Part C – Income. List the monthly gross income (before taxes and other deductions) of each party. There are also boxes for pre-existing child support, alimony, and awarded alimony. (Alimony is an addition or subtraction of one’s income). “Line 2” is the total amount of each party’s income. Total the income for both parents in the third column of Question 2. Part E – Basic Child Support Obligation. The law provides for what it should cost to raise a child in Maryland, and is dependent on the number of children, and the joint income of the parents (parents who earn more have a higher obligation than parents who earn less). The amount increases for every $50 of income the parents earn. 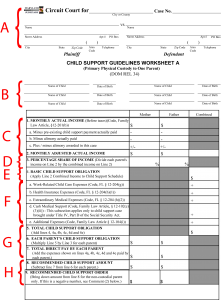 To find the “Basic Child Support Calculation” use this chart. First scroll down to the combined income (rounding up to nearest $50) and then scroll over to the number of children. For example, if the parent’s income is combined $8222 per month, and there is 2 minor children, the “basic obligation” would be $1601 / month. (Found by scrolling down to $8250, and over to 2 children. Part F – Additional Charges. Child support includes not only the “basic” amount but any additional necessary costs including Work Related Child Care costs (the amount one parent pays out of pocket for child care so that he or she may work), Health Insurance expenses (the amount one pays for his or her children to be included in one’s health insurance plan), Extraordinary Medical Expenses (those expenses above and beyond general health care), and any Additional Expenses, like private school tuition if the parents so agree (or a Judge orders). Part G – Total Child Support. By adding up the “Basic Child Support” amount (Part E) and the Additional Charges (Part F) we arrive at the Total Obligation – the total amount the State of Maryland says it costs to raise a child. Then, multiply the total amount by the percent of each parent’s income (Part D) to find each parent’s obligation. (If the Mother earns 40% of the joint income, and the total child support is $1,000, the mother would be responsible for 40%, or $400, and the father 60% or $600.) Finally, write in the total amount each parent pays out-of-pocket for necessary expenses (Part F). Part H – Recommended Child Support. After figuring each parent’s child support obligation (his or her pro rata share), subtract out the direct pay for each parent. (If the mother above pays $150 per month for after-school child care, she would receive a credit of $150 against the $400 she would be responsible for. Her Recommended Amount would be $250.). Child support is only paid one-way. In almost every case the non-custodial parent pays the custodial parent child support. Therefore, whatever the non-custodial parent’s Recommended Order is should be the Child Support Order.